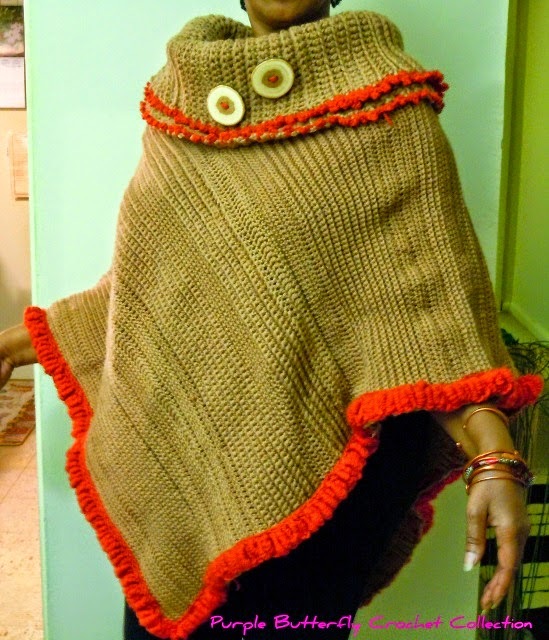 Oh the Spring weather is the perfect time for crocheted ponchos. 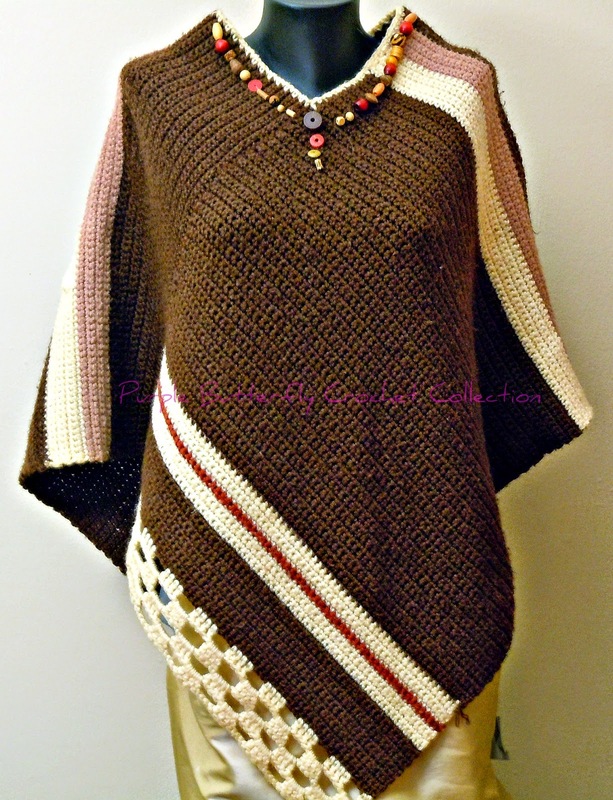 The weather is not cold enough for a coat (but if you count the last couple of cool Spring days you could even wear a mid length sweater underneath) but just to keep the chill off the poncho is just the right accessory. Being a 60's child I remember wearing my crocheted ponchos a lot while I was in Junior and Senior high school even crocheting some ponchos for my classmates. 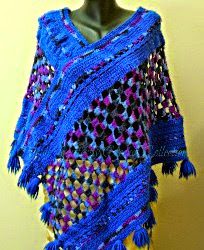 This particular poncho is 100% wool including the edging. I got the inspiration for this poncho from a television commercial. Of course the favorite part for me was the cowl neck. I decided to give this crocheted poncho a different look in that it is not the hanging type cowl. Stiffer yet soft but can be worn up as a high collar. The cowl sits right on your shoulders. I placed a thin elastic inside right around the bottom of the cowl to keep it right on the shoulder or it can be worn off one shoulder as well. To be entirely crocheted in the rib stitch with 100% wool it is quite light yet warm. I had been dying to use this one skein of orange wool that I bought just to use as an accent. With the picot stitch I loved the way it added a uniqueness. To add even more flair I added two hand craved wood buttons done by the talents of William of OruAka's Wooden Jewelry and Accessories. William's buttons caught my eye last year as I was searching for unique buttons. I have a shawl pin I'll be ordering soon for a new wrap. As a bonus to the readers of my blog....... William is offering Free shipping for his items to ALL of my blog readers when they use the coupon code "FREESHIP" . You are sure to find a lot of quality crafted wood items handcrafted by William in his shop. Now for part of me that celebrates me as unique, and proud of my heritage. My rendition of an crocheted "Earthy type" poncho accented with African wooden beads. I had a lot of fun choosing the beads which came from crafter: Nia Yaa on Face Book. I used the single crochet stitch and accented at the bottom with a row of Block Net crochet stitch.....* Just a little note: as a crafter I purchase for myself handcrafted items. I try to buy my items from those small business persons like myself. The beads were so assorted I changed my mind about which ones to use several times before deciding on the arrangement you see here. For orders I can add the same beads or I can add completely different beads (various colors, shapes or all the same color). 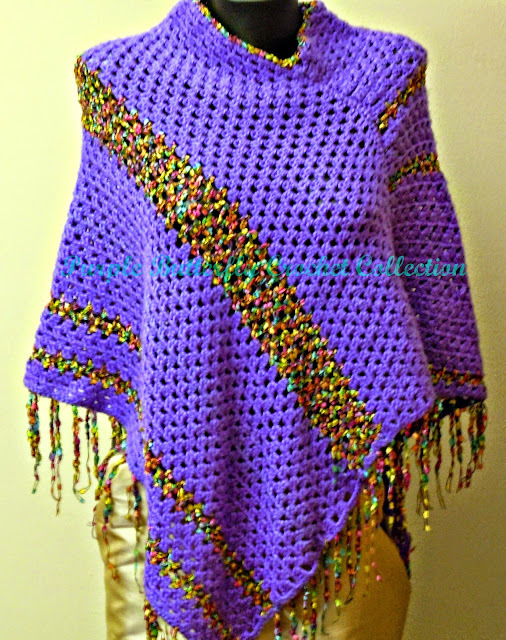 This particular poncho is not as thick as the crocheted poncho above but warm. Just the accessory for the chill in the movie theater, train or airplane trip or a night on the town. Both of the poncho are very easy to wear. They are also quite easy to carry right in your tote bag. For care both need just cold or warm water washing, roll out the excess water and lay flat to dry. I always recommend that crocheted items never be hung for storage. It has been quite awhile. Life changes but developing a better schedule. So on to one of my favorite activities. I attended a women's conference last week which I greatly enjoyed. We were asked to wear white. I not being one to wear summer hats (unless they are made of straw or a head wrap) decided I needed to wear something different. Just what could I crochet that would be in the "hat" category yet be comfortable in the summer heat? 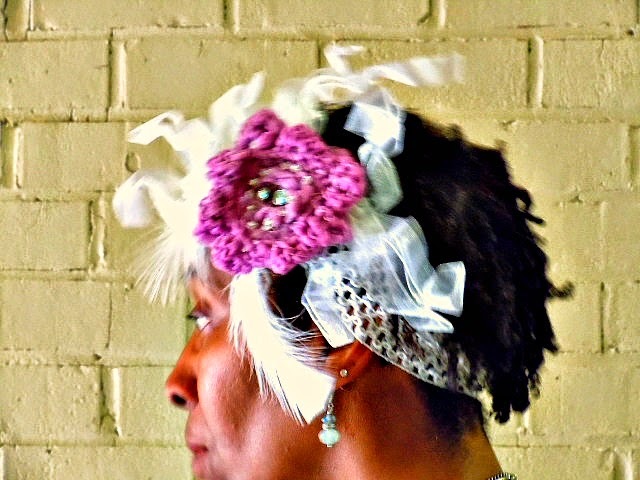 Crocheted fascinator to the rescue. Yarn was going to be out of the question but ribbon was just to my liking: lightweight, sheer and bendable. Of course my favorite color purple had to be included. The ribbon pictured to the right was different but great to work with. I have to say that is was very comfortable to wear. With everything bending I was able to move feathers out of the way from my eyes. I want to experiment with a different feathers.